Recently Fred Wilson of Union Square Ventures wrote a post called “The Pre-Product Phase” in which he outlined a key weakness he says he has, mainly the inability to fully understand a product and it’s potential when that product is presented through wireframes, sketches, fully designed screens, etc. For the record, Fred is not saying that wireframes, sketches, and designs don’t have value. He’s just saying that for him, he has a hard time grasping a product and understanding it’s viability without experiencing the product in real time — fully coded and fully functioning. As a user experience designer, I had a strong reaction to this and commented on Fred’s post. But I also wanted to follow up on this idea and start a discussion about the pre-product phase and the value of it. This idea of getting to a functioning MVP (minimum viable product) as fast as possible is something that’s been on my mind a lot recently. Not a day goes by without reading an article or having a conversation that involves discussing an MVP. But the big concern I have with this is that in the race to getting to an MVP, is the user experience being compromised? Today consumers understand what user experience is. They may not call it “user experience”, but they sure do know if something is easy to use or what they refer to as being “user friendly”. The risk that you take in rushing to get to an MVP is not just focused on whether or not you product has a great user experience. You also risk spending a lot of precious time and money as you have to go back and fix mistakes that could have been solved had more time be spent in the pre-product phase, crafting the product through wireframes that help identify and outline key user-flows, screens, and various states of the experience. Let’s face it, most changes to a product a lot easier to change something in Omnigraffle (a wire-framing tool) or Photoshop (a visual design tool) instead of in code. For example, I recently completed the user experience for a mobile app that will help connect members of a workspace. The end result was about 65 pages of wireframes and user-flows that detailed all the functionality of the app. 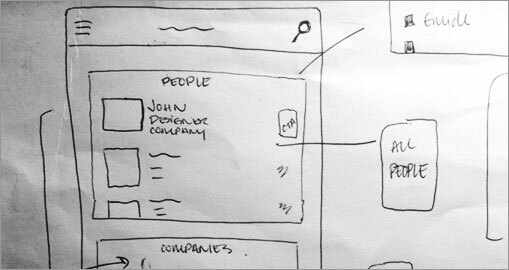 And before we ever sketched a single wireframe, we spent two days brainstorming with the team, understanding their business, customers needs, existing technology, and their brand. If you’re not used to looking at wireframes I can see how this document could be overwhelming. But, now as the developers start writing the code and the visual designers start giving the product it’s design, nearly every question that comes up can be answered by the wireframes, or the wireframes can at least be used to frame the discussion and ensure everyone’s on the same page. Imagine starting to build a house without a set of blueprints? Could an electrician or interior designer get started on their job without seeing a set of blueprints of the building? Probably not! There’s immense value in the blueprints because they get everyone on the same page and help ensure that everyone has a common vision. I realize that Fred’s post was not saying there’s no value in the pre-product phase. However, I do feel like as the pressure to get to an MVP increases, many teams don’t dedicate enough time or money to the pre-product phase!! So, I just wanted to outline the value that can come from the pre-product phase as I’ve seen in my work as a user experience designer. Hope this was helpful!